Edit JMS Connection dialog enables to set up JMS connection. The dialog can be opened from Outline Pane (See Creating Internal JMS Connections) or from Navigator (See Creating External (Shared) JMS Connections). Validate connection Validates the connection. The connection is validated locally even if the project is remote. 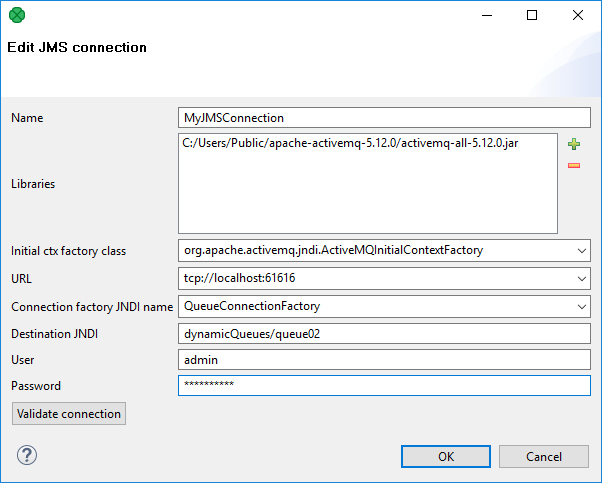 If you are creating the external (shared) JMS connection, you must select a filename for this external (shared) JMS connection and its location.